Two of Italy's richest northern regions have voted for more autonomy, according to their leaders. 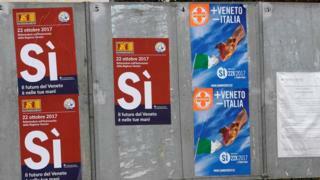 More than 90% of voters in Lombardy, home to Italy's financial capital Milan, and the Veneto region around Venice, voted yes in the non-binding referendum, their presidents claimed. Both men are members of the Northern League, which has long argued that the north is subsidising the poorer south. The regions together account for about 30% of Italy's national wealth. They contrast sharply with the crisis in Spain where one of the richest regions, Catalonia, held an referendum on independence on 1 October, despite the country's constitutional court ruling it illegal. In response, Spain's government plans to impose direct rule. Reality Check: Do referendums bring about change? But President Roberto Maroni, who leads Lombardy, where voter turnout was about 40%, has sought to distance the Italian vote from the situation in Spain. "We are not Catalonia," he told Reuters news agency in Milan. "We remain inside the Italian nation with more autonomy while Catalonia wants to become the 29th state of the European Union. We, no. Not for now." One of the regions' main complaints is that they send much more in taxes to Rome than they get back in public spending, and want to roughly halve their contribution. Lombardy, Mr Maroni says, annually pays out €54bn (£48bn; $64bn) more than it receives while for Veneto, where voter turnout was higher, at between 57% and 61%, this figure is said to be about €15.5bn. "Our taxes should be spent here, not in Sicily," Giuseppe Colonna, 84, told AFP news agency in Venice. But critics object to millions of euros being spent on referendums when all regions already have the constitutional right to negotiate directly with Rome. "Once you open up the issue of what the northern regions pay, then I expect a backlash in southern Italy," Giovanni Orsina, history professor at Rome's Luiss-Guido Carli University, told Reuters.